Bob Feller is widely considered one of the greatest pitchers of all time by fans, players and experts alike. Despite his clear impact on the game, some of his cards are, arguably, overlooked considering his pitching prowess. There are great condition rarities like his 1948-49 Leaf card and less expensive, yet popular issues, like his 1956 Topps card. In the following article, we take a look at all the cards that picture Rapid Robert through the eyes of collectors. Cleveland, Ohio, has been home to some of the greatest athletes in the history of the sports. From Jim Brown to Satchel Paige, from Otto Graham to Bob Feller, several legends have made a huge impact on the sports world over the decades. Most of these legends are also highly collectible. In the following article, we explore the great cards, autographs and other items that are connected to some of Cleveland’s most famous names. In the history of trading cards, there aren’t too many sets for the modern-era collector to choose from when it comes to golf, but the prewar era is fairly rich with some small but important issues. One could argue that the 1927 Churchman’s Famous Golfers set is about as popular as any other golf issue from the period. This 50-card set contains two cards each of golf megastars Walter Hagen and Bobby Jones. It also contains four different cards of Harry Vardon, the highest number of cards devoted to any one golfer in the set. Most of the black-and-white cards are vertical in nature, but a few are horizontal. This year’s winner for Best Vintage Miscellaneous Sports Set of the Year carries a GPA of 8.56, making it the finest on our all-time list. Click here to view this collection. The PSA Set Registry Luncheon was held on August 1st at the National and we had a full house! We will post images of the event shortly on the PSA Set Registry Scrapbook page. The success and growth of the PSA Set Registry is due, in large part, to you, our members. We thank you for your continued support! We look forward to seeing you all next year! 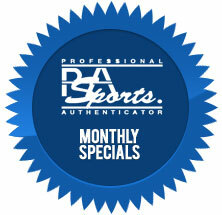 All Sports & Non-Sports Cards – $8 per Item/No Minimum – 30 Business Days (approx.) Click here for details. Know your cardboard? Prove it! Play PSA CardSlugger to test your skills. 5,000+ new cards have been added to the game! Clean Sweep’s current auction is our unique affordable autograph and memorabilia auction (with some cards). Nearly all items have a retail value of $500 or less, and the minimum bids are very low. SCP Auctions is proud to announce that company principals David Kohler and Dan Imler secured last week an astounding collection of more than 3,500 T-206 Cards from a private collector living in the northeast whose lineup included the incomparable Honus Wagner T-206, which was graded by Professional Sports Authenticator (PSA) on site at the 35th Annual National Sports Collectors Convention (NSCC) in Cleveland. 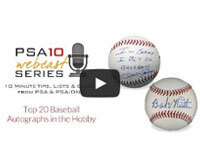 Boxes, by and large, are not the most coveted things in the sports memorabilia industry. They are used to tote inventory and used as shipping materials. However, when the boxes are original to the items in which they were made to hold and still, indeed, hold those items, then boxes take on a whole new meaning and value. Collect Auctions will have a whole bunch of "boxes" in a sale that runs from July 21-Aug. 7 at www.collectauctions.com. Mile High Card Company is happy to announce its Summer auction will culminate on August 14th and August 15th. This auction, while smaller in lot size compared to traditional MHCC events, offers an impressive array of high-profile cards, memorabilia and sets from all sports with something to pique any collector’s interest. Additionally, the auction is separated into two sessions that close on consecutive nights, the latter session dominated by the impressive Todd Hester collection. "We’re particularly proud of the quality, in all facets of collecting, that this auction offers". One of the highest quality collections of individual sports cards in the hobby will join a fresh find of high grade 1911 M101 Sporting Life cards and hundreds of vintage cards, unopened packs, autographs and other sports memorabilia in Memory Lane’s Summer Classics Auction. More than 1,000 lots are included in the auction, which will close August 23. Sterling Sports Auctions #34 offers 597 lots from the four major sports, boxing and non sports with many PSA graded cards. There are 856 lots for auction that will end on Thursday August 7, 2014. Value aside, which Bob Feller card would you want to own most?